Did you know that there is one place where almost all potential leads for Realtors go every day? In fact, it’s almost a guarantee that leads are going there during their home search. That one place is the internet. We are sure you have heard the statistic that 92% of home buyers use the internet at some point during their home search. That research comes directly from the National Association of Realtors. Is your real estate business on the internet? Are you giving the person who is shopping for a home right this very moment on the internet a chance to find you? Do you have a personal website? Your brokerage likely gives you a website. But like most brokerages, your website is not “personal”. It has your name, contact information, something about you, and your most recent head shot. Just like everyone else in your brokerage. Just like every brokerage in your town. Think about this. If someone came into your office and told you that they overheard a group of people standing in line at Starbucks down the street saying things like “I want to buy a home in this town, but I don’t have a Realtor yet”, what would you do? Probably grab your wallet and stack of business cards and buy those people their Tall, Non-Fat Vanilla Latte With Caramel Drizzle, or whatever people order at Starbucks these days. You would go where the leads are. Then you would strike up a conversation with every one of them, ask them what their needs are, and explain a little About You and About Your Specialties. You would make a personal connection. But you have to go to that Starbucks, and that requires your time. And that assumes home shoppers without Realtors are there when you are. You can do better than that with a personal website. You can go where the leads are. Your website would be your business card and more. Your website can make that personal connection to all those leads on the internet. Best of all, a personal website is always working. It is working when the home shopper is on the internet on the weekends, while at “work”, after they’ve had dinner, and even while you are sleeping! So why do so few Realtors have a personal website? Do those excuses sound familiar? Every Realtor knows the importance of having a personal website, but they all seem to have an excuse not to get one. What is holding you back from getting a personal website? In Step 1, we explained from the 50 thousand foot view the reason that Realtors should have a personal website. The Cliff Notes summary is that potential leads are on the internet, so it’s critical for Realtors to go where the leads are. A website is always working, even when the Realtor is not. A website doesn’t sleep, it doesn’t take lunch breaks, and it doesn’t have kids that have soccer games. A website has potential to generate leads 24 hours a day, 7 days a week. No Realtor can work nonstop like a website can. A website is an extension of a Realtor’s brand. It allows a visitor to learn about the Realtor, the Realtor’s specialties, and the Realtor’s niche. A website is a business card for the Realtor. A great website SELLS the Realtor to the lead. A website is professional. Having a good website makes a Realtor appear more professional to a lead. And considering how few Realtors have a good personal website, it is an easy way to stand out. What do you think are other important reasons for a Realtor to have a personal website? Sure, having a website is important. But it doesn’t do any good if people don’t know it exists. Your website is not the “Field of Dreams”. Just because you built a website doesn’t automatically mean that leads will come. You have probably heard terms like SEO (Search Engine Optimization) and SERP (Search Engine Results Page), and how it’s critical those are. They are important, but we have some good news and bad news about SEO and SERP. The good news is that a good SEO will rank you high on SERP. And if those are good, then people will find your website through Google, Yahoo, Bing, and other search engines. The bad news is that it takes time get good SEO to rank high on SERP, or money to get there quick. A good website developer can give you good bones for SEO, but then it is up to you to develop good content marketing by blogging and other SEO methods. The alternative is to pay for ads through services like Google AdWords or Facebook ads. Having your website rank high on searches is an important thing, but it’s not the only thing. You can still get tons of value from your website without blogging. Don’t get me wrong, blogging is very important. But it’s the long game that pays off massively in the future. But for now, we’ll focus on the things you can do right away. And these next 7 steps will take you no longer than half a day and are completely free! The value you get from this strategy will drive immediate traffic to your website, which will inherently help your SEO a little bit too. Include a link to your website in your profile of all of your social media accounts. These include your Twitter, Facebook, Google+, Instagram, Pinterest, LinkedIn, and any other accounts you use for your real estate business. Why do this? People following you on social media need to know how to find your amazing website. On a side note, it’s ok if you don’t use every form of social media. In fact, it’s best to focus on just a couple that you are comfortable with, rather than having every single one that you can’t devote your time to. Make a post or a tweet or a pin advertising that you have a website. Update your Zillow profile to include a link to your website. Why do this? Zillow seems to get all the real estate traffic. Visitors to Zillow who see your profile are either looking for a property or for a Realtor, and they need a link to your website to take them away from Zillow. Have a Trulia account? Update that too. Realtor.com? Ditto. Put a link to your website in your profile on your brokerage website. Why do this? You will stand out from all of the Realtors at your brokerage that don’t have a personal website on their profile. Put your website address on your business cards. Ok, so ordering new business cards isn’t free, but it is a very minor cost. Why do this? Your business card is a mini advertisement for you with your contact information. A lot of people prefer to go to websites than to call a Realtor right away. Put a link to your website in your signature line of every email you send out. Why do this? You want to make it as easy as possible for the people you email to go to your website. Links in emails are clickable, making it extremely easy for people to get to your website. Include links to your social media profiles in your email signature too. Finally, email your entire database to let them know you have a website. Ask them to go to your website and send you their feedback. Ask them to forward the email with your website to anyone who may need a Realtor when you ask for referrals. Why do this? This is probably the most important point on this list. Almost any reason to email your database is a good reason. And this email will help get the word out about your website faster than any other method. Forwarding this email will be easy for your clients to do, and they are more likely to forward it if you ask them to. Are there other steps that you think would be helpful to get the word out about your website? Websites for Realtors are different from websites for any other type of business. Your business is unique. Your leads and clients have different needs. Your website is selling you while providing value to visitors. Your business is very local to the few communities that you serve. Your business relationship with your clients is more personal than in other businesses. A website developer who makes websites for any type of business may not understand or appreciate these differences. That website developer may not be able to guide you on the type of content to include on your website, and how to present it. That website developer many not know to build the pages that are critical to your real estate business. IDX is the way that visitors can search your local MLS on your website. Leads and your existing clients go to the internet to search for homes, so give them a reason to go to your website to do just that. And a good IDX system will provide SEO benefits as well to help with Google, Yahoo, and Bing searches. If the purpose of a Realtor’s website is to generate leads, a visitor that finds the website needs a reason to become that Realtor’s lead. The About Me page is the best way for a Realtor to sell themselves. And About Me pages are generally the most visited pages on most websites. Potential leads want to learn about you. Sell yourself to them by letting leads know how you will help them. Do you know why review sites like Yelp and TripAdvisor are so popular? Because people trust the opinion of random people. It is called social proof. The more positive reviews the better. Before contacting you, potential leads want assurance that you provided past clients with a great experience. Some of your best testimonials should presented on the your home page, and you should have a Testimonials page to show the rest. Gotta give visitors a way to contact you. Believe it or not, a lot of Realtor websites leave this out. That makes us cringe! Realtors need to show that they are local experts for the communities they serve. A page for each community you serve is just the way to do this. Be as detailed as possible. Visitors will get value from it, and Google will love it. Think of all the questions that people ask you about the communities you serve? Answer them. What information do you think would be valuable about the communities? Include it. There is no such thing as “too long” when it comes to Community Pages. This is a bonus because a blog is something that should not be bought from a service. It is truly up to the Realtor or the Realtor’s team to maintain. Even though it is time consuming to write blog posts, a good one is invaluable for a Realtor. A good blog filled with tons of helpful local content will be the darling of Google’s eyes. A good blog will help a Realtor rank just below Zillow. A good blog will also provide value to visitors, and leads will feel like they know you. Who would a potential lead rather work with? A random person with a website, or someone who they feel like they know? What other pages or type of information do you think would be important to include on a Realtor’s website? We will explain how this website can be a hub of the marketing side of the Realtor’s business. How is a website a hub? Because the other tools and processes are the spokes. Assume you have a personal website for your business. This website has all the components from Step 4: IDX, About Me, Testimonials, Contact Forms, Community Pages, and a blog. People find your website from your email signature, from Google searches, from your social media profiles, from your business cards, from your profile on your brokerage website, and from referrals – the spokes. 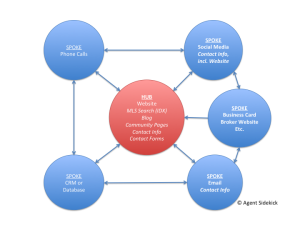 All of these spokes drive traffic to your website – the hub. So now leads land on your website. When these people get value from your website, they may choose to follow you on social media (a spoke). Or more importantly they may email you (another spoke), call you (one more spoke), or fill out their information in a contact form (that’s a spoke too) that gets delivered directly to your email. If you have a CRM (yep, that’s a spoke), this lead can be created automatically so they are now in your database without any data entry from you. Your marketing engine is working so leads are contacting you! What type of lead is more quality than a lead that contacts you directly? Then those new leads that are now on your social media or that you email will be reminded to go back to your website to get value from the IDX, community pages, your blog, and other pages. The leads are being nurtured. Potential leads can’t organically find you through Google searches. Leads and clients don’t get the value of using your website to search for homes. Sure, they can use your brokerages website to do that, but then you can’t track their searches, or provide your branding. At a minimum, it becomes a lot harder. Worst case, they use another Realtor’s website to search for homes. Leads can’t provide contact info through your website that gets delivered directly to you and your database or CRM. Of course there are more reasons, but you get the idea. What is the hub of your marketing engine right now? Build a website or focus on your business? We have really dug deep into the value of having a website as an independent business, how to get the word out about your website for free, and how a website can be the hub of a Realtor’s marketing engine. Every Realtor is bombarded by advertisements for buying or tools to make a website of their own. Deciding how to actually get a personal website can be overwhelming! We know figuring it all out can be overwhelming, and we want to help you understand what your needs and comfort level are. If you are considering getting a personal website, and we hope you are, you will find this information long, but full of value bombs! Paying for someone/company to make your website. Paying a company so you can make your own website. You should use this option if you don’t have time to make your own website. If you don’t feel comfortable to learn the technology. If you want a good website done right. There are several options for you to consider that are all very different. There are a lot of people and companies out there that build websites for any type of business. And they usually build really nice looking websites. They may even have a couple clients who are Realtors. In general, this type of website will cost several thousand dollars. You may have to find hosting yourself, or they can host it for you for a reasonable monthly fee. You will have to pay for IDX on your own. Just make sure these developers have really good experience with Realtor websites, because your needs are unique. Check out Step 4. These companies have website templates that each website they build will be built from. There are customizations, like logos, fonts, colors, images, content, and many other things to ensure your website is unique. The companies will either charge a more reasonable one time fee than the first two options (less than a thousand dollars), and charge a monthly fee (less than $200). Usually the fees include IDX, but sometimes you have to pay for it yourself. Usually the fees include hosting, but sometimes you have to pay for it yourself. And they sometimes offer additional services for additional costs. You want to check the box that says “I have a personal website” with no frills, no IDX or IDX with little functionality, and limited localization for your communities? This option is good for some people in some less competitive markets. This type of website will be very inexpensive, sometimes with a small one time fee, or a very small monthly fee. If you want someone to make your website for you, you should first determine your needs and how much you can spend. This will help you determine which option class you fit into. Then you need research companies, and compare them against each other. Why spend time researching? One reason is that you will be spending at least several hundred dollars up front in setup costs, unless you go for Option 4. Another reason is that you have hopefully learned the value of a personal website, so you need to make sure it fits into your business and marketing strategy. We won’t spend as much time on this one, because there are two very different options for this. You have probably heard the term “WordPress”. That is the platform that most websites are being developed on. Why? Because it’s good; it has great built in SEO; it has great flexibility. Unfortunately, it also requires a certain level of technical expertise and time to learn it. But once you know how to use it with an intermediate level of technical expertise, you can create some amazing websites. These include website development platforms like Wix, Weebly, Squarespace, Jimdo, and a few others. You can make a nice looking website very easily with these, and costs range from FREE to $10 or $20 per month. These are great for beginner website developers, and many of them have great reviews. They may have limitations. One being that they may not be able to integrate IDX. But if creating your own website interests you, then it would be worthwhile to research these options to determine the one that will work best for you. If you want to build your own website, and you don’t have time to learn WordPress, then we highly recommend an easier platform discussed in Option 2. Yes, these exist. And they do fit a niche for some Realtors. These companies have created templates and website development tools on WordPress. They make it almost easy as Wix, Weebly, Squarespace, and Jimdo to build and customize your own website. There are huge benefits to this, in that the website will have all the customizations available on WordPress, the speed of WordPress, and will definitely integrate with IDX. The drawback is that they will cost almost as much as (or more than!) companies developing semi-custom websites for you, and you have to do the work yourself. Thanks for making it this far! Whew!! As you can see, there are lot of options to consider for your new website. But that’s a good thing, because every Realtors’ needs are different. Some want to be delivered a turnkey website, while some want to dive in and build their own. Our thoughts are that you are a Realtor, not a website developer. It’s not worth your time to try to develop a website, when that time would take you away from your real estate business. Curious about where Agent Sidekick fits in to those options? We build websites for Realtors under Option 3: Real Estate Website company building semi-custom websites. The difference is that we do much more than that. We recommend that you take a Product Tour or contact us for a Free Consultation to learn more. What are your needs for website? We covered a lot of topics from why a website is important all the way to learning the options that are out there. Although there is a lot to think about, the sooner you get started with a website for your business, the sooner you can start driving traffic to the website with the strategy we discussed in the Step 3. Maybe by now you know what you want from a website, then hopefully Agent Sidekick is right for you. If you want to learn more about Agent Sidekick, We highly recommend taking a Product Tour on our website. Or you can request a Free Consultation to learn how we can help your business, and we will be in touch soon. If after the Free Consultation you decide that Agent Sidekick is not the best fit for you, we will be happy to make recommendations of companies or services that would best serve your needs. Bottom line is that we know a personal website is critical for every Realtor to have, and we want to help. We know Realtors are busy. That is why we can give your Free Consultation at a time that is convenient for you.